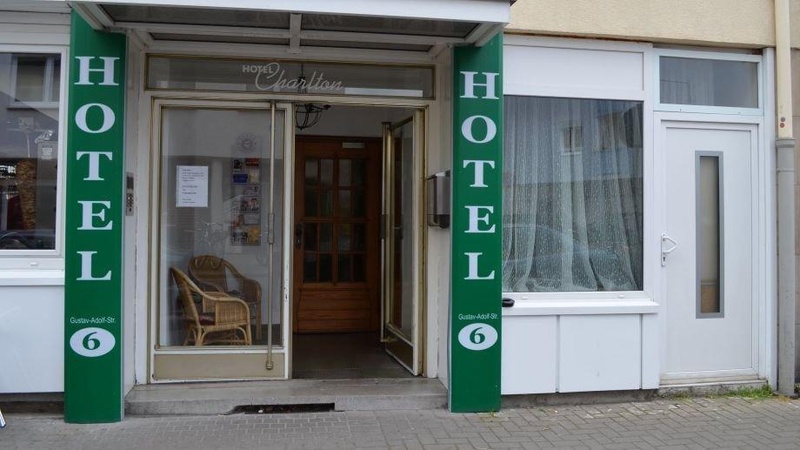 We would like to proudly welcome you to the Hotel Charlton. It doesn't matter whether you're staying for one night or more, you will find plenty of parking spots available at the well-appointed hotel. Free for you On arrival at the hotel you will receive a free bottle of water. When booking with us, you will enjoy complimentary parking at the hotel. Feeling peckish? Grab a plate in the hotel's own café that also provides dishes suitable for our vegetarian guests. Where you will stay Each room is equipped with a desk so you can easily transform it into an office space. Satellite TVs are available in all of our rooms. The convenient minibar is available to you at your leisure. Each hotel room features a telephone. Bathrooms in this hotel come with windows. In your room's bathroom you will find a shower as well as a blow-dryer. Business hours of reception: On business days: from 06:00 to 00:00 On the weekend: from 06:00 to 00:00 . Close to city centre. Near Metro station. Restaurants around the corner. Fair city hotel. Close to the city center and public transportation. Friendly staff. Upgrade free of charge. Nice service. Large closet. Large desk. Low lighting. W-lan didn't work properly. Wifi in my room did not work. Wifi can be improved. No breakfast served. No breakfast. No lift. No facilities. Without elevator.